All transactions are safe and secure with a reliable history in online purchasing behind each of our associates. Buy the Daria Skull t-shirt to own Daria clothing and merchandise. How do you get a football player like Kevin Thompson to be interested in Shakespeare? You inform him that Hamlet has a skull in it! This was her brilliant idea and it is celebrated on this MTV Daria t-shirt. Unfortunately, he was actually supposed to be learning another classic. It is likely that this assistance is her idea of community service. Get the complete Daria TV series DVD to relive these memorable moments. 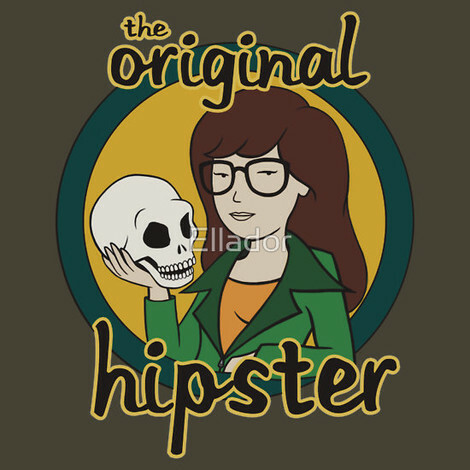 In addition to the Daria Skull tee above, browse the Daria Clothing Gallery for more apparel like men's and women's clothes, kids shirts or hoodies.